Should politicians focus more on men, less on women? Despite all the talk of women's issues, elections show men have less party loyalty and are more likely to be swayed by a particular candidate. WASHINGTON — Sorry, fellas, but President Barack Obama’s re-election makes it official: Women can overrule men at the ballot box. For the first time in research dating to 1952, a presidential candidate whom men chose decisively — Republican Mitt Romney — lost. More women voted for the other guy. It’s surprising it didn’t happen sooner because women have been voting in larger numbers than men for almost three decades, exit polls show. But men, who make up less than half the U.S. population, always have exercised power greater than their numbers and they aren’t about to stop now. Despite all the focus on candidates courting Hispanics or the working class, men are the nation’s ultimate swing voters; they’re why Republican George W. Bush became president and Republican John McCain didn’t. Their move away from Obama this year expanded the voting “gender gap.” It wasn’t enough to determine the outcome, but came close. Like Wolbrecht, he noted that the sexes aren’t that different, at least when it comes to the issues. Studies have found that the opinions that separate liberals and conservatives, even on issues such as abortion, don’t divide the sexes much. Men and women are about as likely to fall on either side of those debates, and millions of each happily line up with each political party. But there has been a consistent thread of disagreement for decades over what role the government should play. It’s not a big gap, but it is statistically significant, about 4 percentage points or 5 points in many studies, Kellstedt said. As a group, women tend to like bigger government with more health and welfare programs; men lean toward smaller government that spends less, except on the military. Besides women’s traditional role as family nurturers, they also live longer than men and so are more likely to rely on Social Security and Medicare. Women are more likely to be poor. They’re more likely to be single parents struggling to pay for child care, education and medical bills. Men may feel many social programs are expensive and won’t benefit them. Women as a group voted Democratic in the past six presidential races, from 1992 through 2012, according to exit polls. The last time they decisively supported a Republican was Ronald Reagan’s re-election in 1984. The Reagan years were when Americans first began taking note of the “gender gap,” as women’s rights groups emphasized that female support for Reagan in 1980 was narrow while male voters overwhelmingly endorsed him. 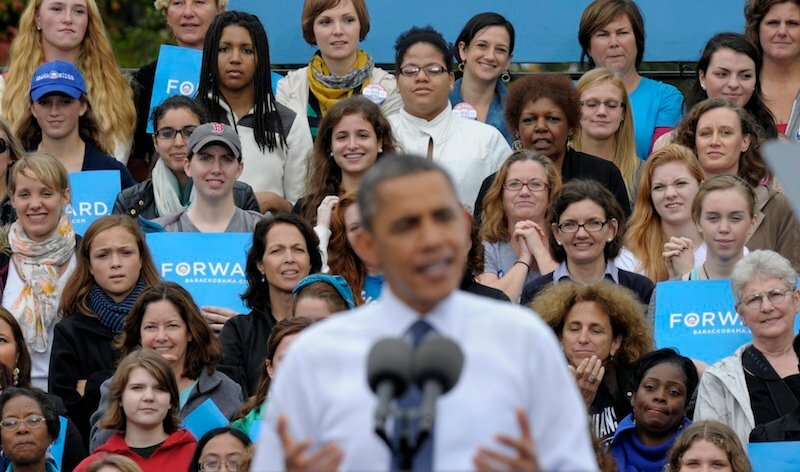 Women’s support for Obama dropped just 1 percentage point from 2008; they voted for him by 55 percent to 44 percent this time. Men’s support for Obama dropped 4 points, flipping them to Romney’s side, by a 52-45 margin. Women were 10 percentage points more likely to vote for Obama than men were, according to the survey of voters at the polls conducted for The Associated Press and television networks. Gallup polling has tracked the gender gap since 1952. Gallup says this year’s gender divide was 20 percentage points, the largest ever using its method of calculation. The gender gap isn’t just a white thing. It exists even among minorities that vote overwhelmingly Democratic. Obama got 96 percent of black women’s votes, but 87 percent of black men’s, compared with 76 percent of Hispanic women and 65 percent of Hispanic men, according to the exit poll. “We group together this white male vote and sort of put that in the Republican ledger and we don’t talk enough about all the various subgroups that fit within men and the multiple issues and currents that determine how they’re going to vote,” said sociologist Donald Levy, director of the Siena College’s research institute.